This project was carried out in a collaboration between Copenhagen Centre for Cancer and Health and the public Danish healthcare platform Sundhed.dk. The two partners sought to make a service that would improve the rehabilitation experience for Head and Neck cancer (HNC) patients in Denmark. We were brought in as consultants to do research and suggest and design a solution. I was the service designer in a team of four other service designers. 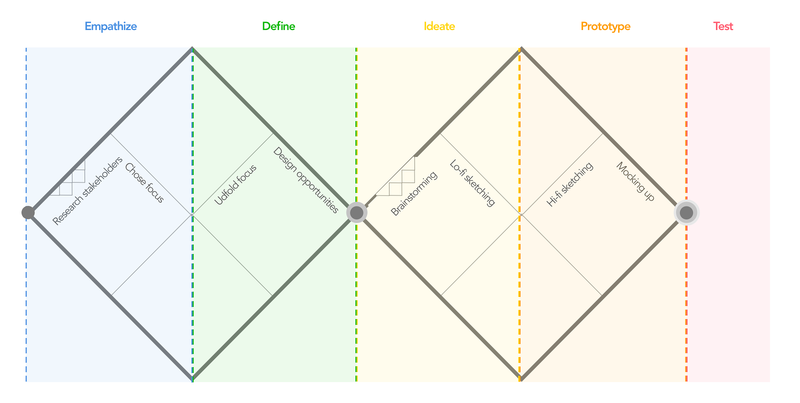 The design process was heavily inspired by the five phases of Design Thinking: empathize, define, ideate, prototype, and test. The foundational research consisted of several interviews with relevant stakeholders, and the design activities were iterative and lean. Head and Neck Cancer (HNC) is a type of cancer that has invalidating and deteriorating consequences for the patients. Once cured, the patients are heavily in need of rehabilitation both for their physical, mental, and social well-being. Copenhagen Centre for Cancer and Health has had great success with their rehabilitation activities. However, the rehabilitation system for HNC-patients is mainly concentrated around Copenhagen, and that leaves most patients in Denmark without the same options for great rehabilitation. 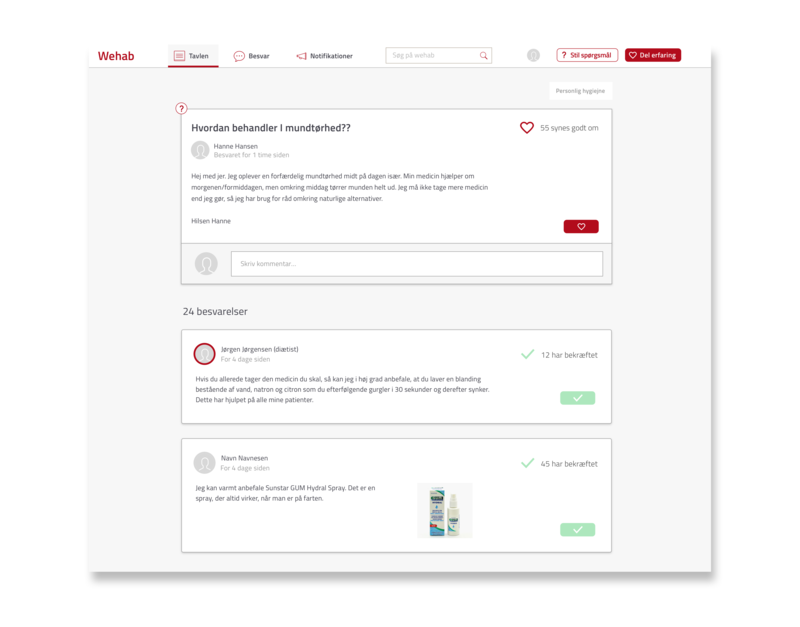 Sundhed.dk is a public healthcare platform that enables citizens and healthcare professionals to find information and communicate. The portal facilitates patient-centered digital services that provide access to and information about the Danish healthcare services. 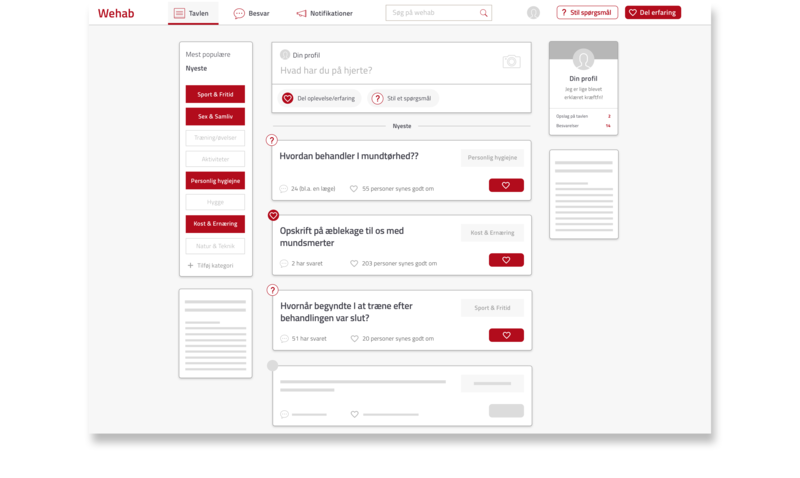 The challenge was to find out how to combine the rehabilitation with the online access on Sundhed.dk and this is what inspired the design process. The first step in the process was to understand the problem and empathize with the patients. To achieve this, we conducted several interviews with relevant stakeholders. This started off with a presentation from the rehabilitation center that helped us understand the employees’ practices, relationships to patients and possible problems. Furthermore, to get insights from a patient perspective, we conducted several in-depth interviews with rehabilitating patients. In addition to the interviews, we decided to work with cultural probes to get an even deeper insight on the patients’ everyday feelings and experiences of the rehabilitation process. For this, we used diaries since a self-reporting approach would allow us to gain insights about the patients everyday lives in a very non-intrusive way. By this we were able to capture contextual and user-submitted data that could be used to understand the participants’ emotions and inspire and inform the future designs. We invited five patients to participate in the study and they each got a bag containing a diary and a few pens to write with. 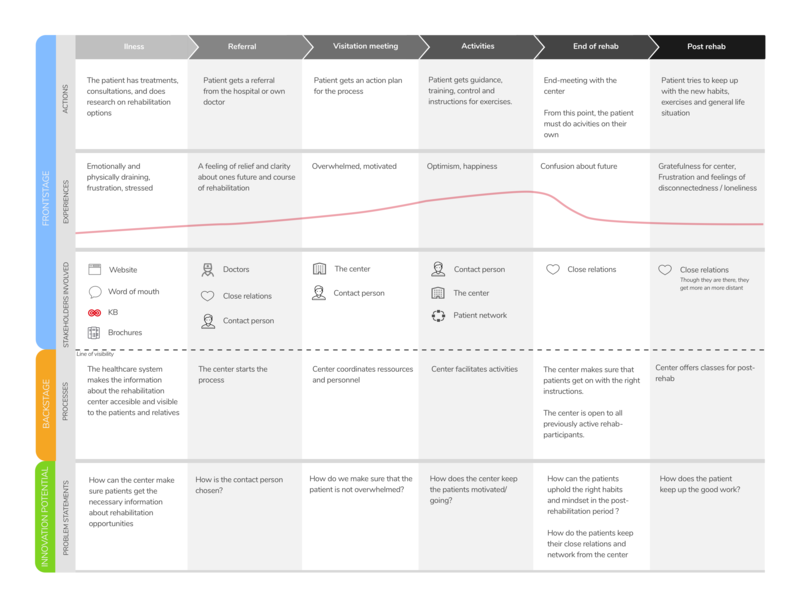 From the qualitative insights, we were able to map out the service, its stakeholders and touchpoints using both a service ecology map and a service blueprint. We structured our process as suggested from the double diamond approach. This led us open up the design space and discuss different possibilities, and then narrow down our focus to find specific solutions. Hence, each phase in the process consisted of several iterations in order to make us able to take valid and well considered decisions throughout. 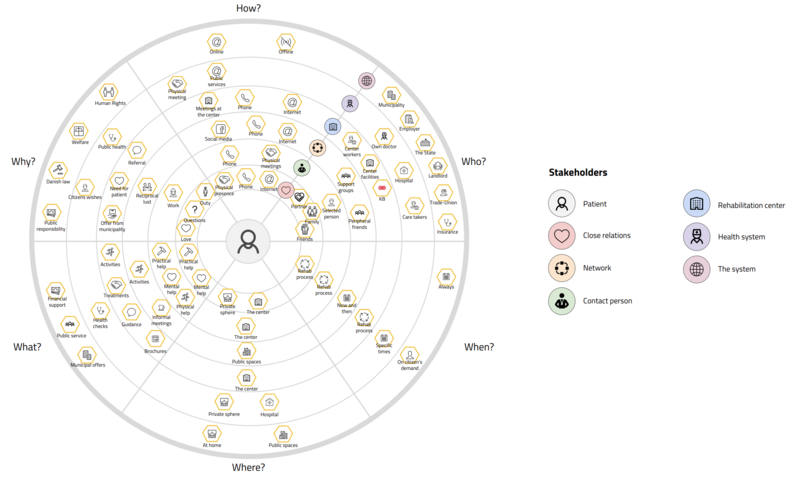 From the insights, we created a service ecology map that shows the stakeholders involved in the rehabilitation process. From this map it is clear that there are many stakeholders involved in the rehabilitation process and that the Rehabilitation center plays a large part in making the rehabilitation process a good experience. We used a service blueprint to map out the entire process of the patient’s rehabilitation experience from the initial stages to the post-rehab stage. The service blueprint allowed us to map out the user journey and highlight possible service failures at specific stages of the service. How might we create a service that gives head and neck cancer patients a space for sharing experiences and getting their questions answered by other patients and health professionals, while strengthens the health professionals’ knowledge of the patients? With an understanding and delimitation of the design space, we moved into the ideation phase of the project. This phase consisted of several sub-phases of brainstorming and sketching. The scope for the ideation phase was to develop a concept built on the opportunity statement previously presented. To go through these phases, we chose a series of design methods that allowed us to open up and narrow down in the ideation phase. We initiated the ideation with a thorough brainstorming session that would allow for creative thinking both within and outside the problem space. We used low-fidelity sketching as a way of concretizing and visualizing our initial thoughts of possible solutions in a quick and plentiful manner. This would create the ground for further discussion and help narrowing the focus. From the sketching exercise, we decided to move on with an idea of a social forum, as this concept had the potential to accommodate the lacking possibilities for patients and health professionals to share their knowledge and experiences with one another. From the low-fidelity sketching and the narrower focus, we started sketching in higher fidelity to discuss the feasibility of the solution. The sketches show the forum where the users can post, and then for the different questions, the users can see whether or not they have been confirmed by others. The users are able to write a question (or an experience) to the forum, and if a similar question has been previously asked, this question will be suggested. Based on the users’ profile settings, the users can filter in the content to see information especially relevant to them. 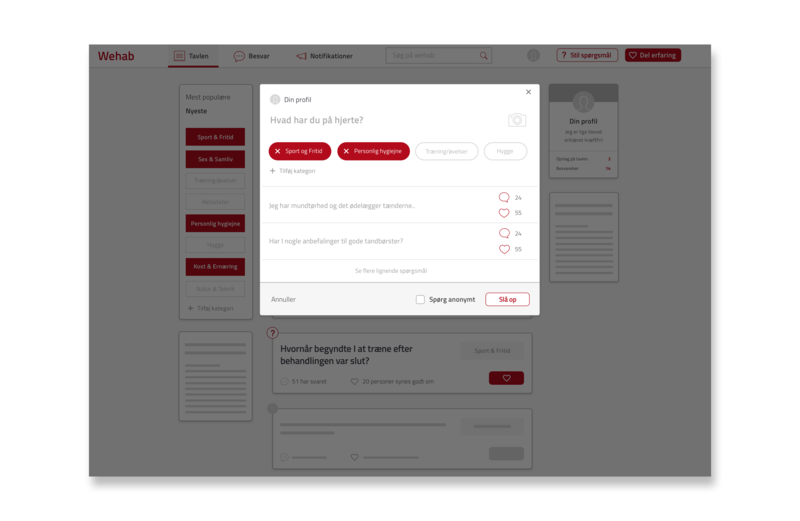 The users can vote on the answers to questions. Votes will indicate to other users what are the most popular responses to questions asked in the forum. The questions and experiences shared on the forum appear in a feed similar to other social media platforms. Health professionals will be signed up as authorized health professionals. This authorization can then be used for validation of questions and answers. The users can follow content and receive notifications about it via email. With help from the scenarios, prototyping proved to be a very useful way of stimulating creativity and focusing on the important elements of the service, since it made it easier to discuss what features to incorporate.